The long awaited arrival of Rebecca Romjin’s Number One might have been substantially overmilked in what was otherwise a damn fine episode of Discovery. On the hunt for the shuttle-stealing Spock, Discovery gets cornered by a huge alien creature that plays havoc with the ship’s systems and counting down to destruction. While all this is going on, Saru is fighting off a virus which, he later reveals, is terminal. 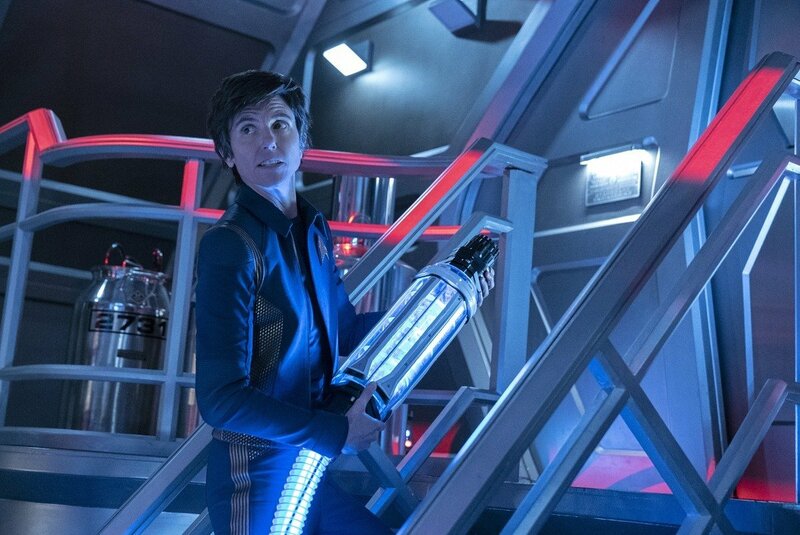 Elsewhere we have Stamets, Tilly and a returning Jett Reno (Tig Notaro) dealing with the creature from the mycelial network. Let’s start at the beginning. Number One’s appearance is pretty cool if brief, serving as a plot mover more than anything else. We get very little character in the few moments she has with Pike and I think it will be a lost opportunity if she doesn’t turn up again to fill us in on the repair work aboard the Enterprise. Lovely little twist around the removal of the holographic comms systems that are causing havoc with Pike wanting to go back to using monitors. Nice ret-con there. The episode has some cracking twists beginning with a malfunctioning universal translator causing all sorts of havoc as the crew try to work out what an apparently malevolent alien creature wants with the Discovery. The effects of this alien are overwhelming and what seems to be three unconnected storylines actually all intertwine. Let's take Stamets/Tilly/Reno first. The sparks do fly quite quickly between Stamets and Reno in the engineering bay with some quality bickering that Spock and McCoy would have been proud of. Due to a change in circumstances though as the mycelial creature escapes and reattaches itself to Tilly they set aside their rather engaging differences at a frighteningly rapid pace to save the day. Notaro is on excellent form as the rather casual engineer contrasting brilliantly against Stamets' much more prim and proper approach to his job but their partnership could well be one of the season's best character highlights and is an amusing aside to the plot. Mary Wise gets to play an even more nervous and distracted Tilly here with one chilling point backed with a rendition of David Bowie's Space Oddity that might rank as one of Star Trek's most unsettling. Cleverly there's a double ending to this piece of the episode which means that this creature which joy-rode back from the Mirror Universe is set for another guest appearance next week. It is a real emotional rollercoaster with Saru providing the real kick to the episode. Starting out with just a cold at a staff meeting (welcome back to the Saurian Linus by the way) the Kelpien's health rapidly deteriorates over the course of the story and while we as the viewer might realise that the intervention of the alien creature and Saru's ailment are linked pretty soon into the action, Doug Jones is a true tour de force here as the weakened Saru. It truly does seem that all is lost with Saru ultimately giving in to the belief that he will die and invokes the desire to be killed by Burnham. 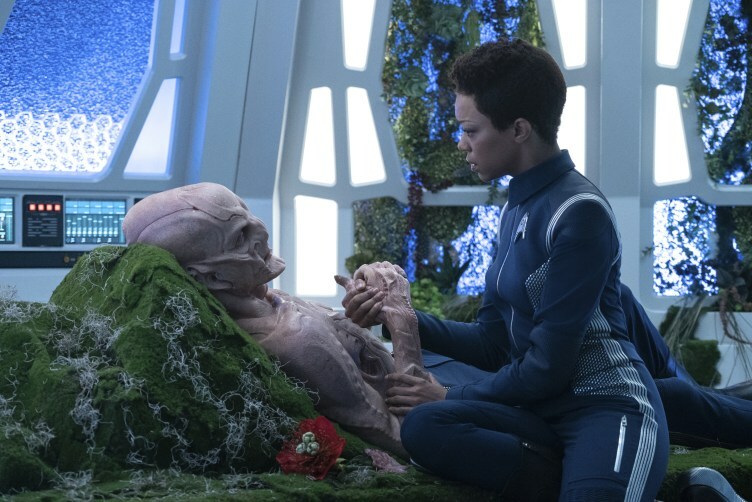 We learn a lot about the Kelpien here and while we were led to believe that the Short Treks were to be totally standalone, The Brightest Star now seems deeply linked into the events of the season with Saru's homeworld and his reasons for not being able to return now featured in two episodes from the four released. The predatory Ba'ul have worked a treat over the Kelpiens making them believe that once the illness takes hold it's game over but ultimately it turns out that the result of the Vahar'ai (had to Google it) actually means that his threat ganglia drop out and shrivel up and also relieve him of his inbred fear. Ok, so this does effectively remove one of the key factors that made Saru right from the first episode but it opens up a whole new perspective on the Kelpiens and just what this revelation - that the Ba'ul had been lying - could mean for his future actions. 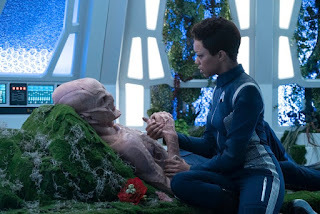 Jones is mesmerising as Saru right from the start here and working in not just the facial but upper body prosthetics for such an emotional scene is mind-blowing. Both he and Sonequa Martin-Green smashed it out of the park here and for a second I didn't know which way this was going. Online it seems there's a lot of thought that both this and New Eden are trying to tread the "proper" Star Trek path but for me the second episode of the season still just doesn't quite work. An Obol for Charon on the other hand is superb. Full of character, packed with emotion and all with a recognisable tale around first (or is it?) contact shows that Discovery really does have a heart and has learnt from the action heavy first season. It can have its moments of being new and different to the series before but this proves that it is Star Trek at its core and slips Saru into being one of the franchise's best creations. Episode four opens even more doors for the season to explore and doesn't appear to have shut any at all. The chase to catch up with the errant Spock is still on and actually assisted by the alien that stopped Discovery in its tracks. Saru's life has changed forever (still not sure if this is a good move so early into the show's lifetime) and Tilly is literally in it up to...well..here. This year is offering up a much wider diversity of stories and character points than season one while not really focusing on the Red Angel story so far. It appears that the show has taken a good look at its predecessors and seen what made them great - it's not all about battles and explosions and with An Obol to Charon we have what could well be one of the best episodes of Discovery that will ever be made. A new classic for a new generation if ever there was one. 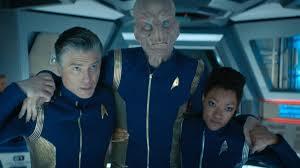 How do you rate the fourth episode of Discovery's new season?